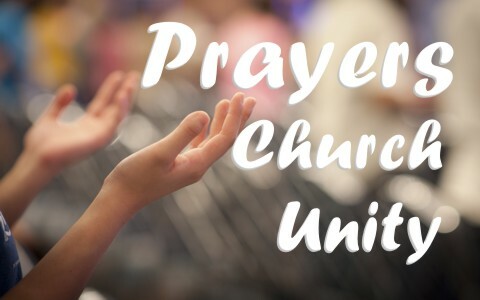 Here are five prayers that may help you pray for church unity. You know that we are called into a community of believers who are to have one mind, and that is to glorify You and to make disciples of all nations, even if we’re only able to reach those in our own community. We realized that we cannot possibly have unity in our local community, the church, unless Your Spirit has His way with us. Until we are gathered together with one mind, we cannot be as effective as a church as we can be. Until You send Your Spirit, our carnal natures may try to dictate what we think we should do, but please Father, help us to focus on the mission that You have for each one of us, and as one body, we can do more when we are working together and not placing our own opinions above those of others, than when we work alone. Help us to see that Your desire is for us to work together as a body does in doing what You have set before us to do, and I pray for You to open doors for us to walk through, but also that we might also see what we are to do in walking through that door and recognize the work You have purposed for us to do. Truly, we know we must be striving to live a holy life and to make Jesus Christ the center of our lives, and only then can we hope to do anything for His glory, and not ours, and in the mighty name of Jesus Christ I pray, Amen. please help our church that we have one purpose in life and that is to glorify You and Your Great Son, Jesus Christ. Nothing else matters because You have said in Your Word that we will not glorify You in our lives if we are not striving to live in obedience to You, and to love one another, which is what we need to do to show the world that our love for one another is how they will know that we are truly Jesus’ disciples (John 13:35). You have testified in Your Word that “everyone who is called by my name, whom I created for my glory, whom I formed and made” (Isaiah 43:7), should be striving to bring You glory and to not rob You of glory for things that we do and ascribe these works to ourselves. We must realize that we have nothing that we did not receive from You Lord (1 Cor 4:4), so if we boast, let our church boast only in You for all the marvelous things You have done for us, and that is our prayer and it is in the name of and for the glory of Jesus Christ, in Whose name we pray, Amen. You are so good to us, even though none of us deserve Your goodness (Rom 3:10-12), and that You alone are good, and so let us join together in one mind for one express purpose and that is to proclaim Your goodness to those who do not yet know You. Oh, God, that they would know You so that You might extend Your grace to them (James 4:6) that they might be saved. Please help us take heed to Jesus’ Words in praying that we might be one, praying “Holy Father, keep them in your name, which you have given me, that they may be one, even as we are one” (John 17:11), and that should be our prayer too Father. Let us be of one mind and have one purpose and that is to glorify You and to tell others that there is only one way that they might be saved, and that is through the Person and work of Jesus Christ (Acts 4:12). Let us join hands and hearts in this single purpose for us to all have one mind and a mind that is focused on You for Your work that You have prepared beforehand for us to do (Eph 2:10), and it is for this that we pray in the precious name of Jesus Christ our Lord, Amen. Please help us to focus on the mission You have given us all, and that mission is to reach the lost and to make disciples of all with whom we come into contact, and to teach them the same things that You taught Your disciples (Matt 28:19-20) and by their writings in Your Word, that we may be taught these very same things. Oh Lord, Your Word stands forever, so let us put feet on our faith in doing what You have commanded us to do, and that is to help the poor, the widows and orphans (James 1:27), but also to visit the sick and those in prison, and to welcome into the family those who are strangers among us (Matt 25:34-35), because we understand that what we do for the least of these, we are really doing it for You (Matt 25:40), but also what we don’t do for others, we are not doing for You Lord (Matt 25:45). I know You take these marching orders seriously, so let us invest our lives into doing what You have commanded us to do, but always doing it for Your glory and not ours, and in the precious name of the Lamb of God, Jesus Christ, Amen. You have placed each one of us in the Body of Christ, the church, as it has pleased You and not us. Help us to recognize that it is You Who have organized Your church and have placed each one of us exactly where we need to be to do Your work and for Your glory. If we can respect those who some might consider to be in a less-than-honorable position, then we can understand that even those who seem to be less in the body are actually those who are more honorable in Your eyes, just as Paul said that the “parts of the body that we think less honorable we bestow the greater honor, and our unpresentable parts are treated with greater modesty” (1st Cor 12:23). We know that You have no greater respect or regard for one person over another, so help us to not have a higher regard for some and not for others (Acts 10:34), and for what we ourselves have been called to do for You. This is all about You Lord and not about us, so help us to prioritize our calling within the body and to respect all members as the same, as You also do, and in the name above all names, Jesus Christ, I pray, Amen. Perhaps you could comment by giving us a much better prayer than the ones that I have written from the heart. There is such importance in our prayers and in particular, our corporate prayers as we send our requests to God through Jesus Christ. May we be of one mind, one purpose, having one mission, and for our community of believers to all be in agreement in beseeching Your help in doing what you’ve called us to do. That is to reach the lost, glorify You in our lives, and to show the world what the love of God truly looks like in the hopes that they might be drawn to You and place their trust in You so that they too might be saved. Previous post: Who Was Legion In The Bible? Next post: Where Does The Bible Mention The Rapture?